Unexplained nosedives engineered by agents acting in the national interests of the Zionist state? Precursors of Remote-Controlled Flights of 9/11? You see, the EC-135N was really an AWACS jet, except that the satellite dish was housed in a protruding nose section rather than in the more familiar disk structure on top of the fuselage of an AWACS, as shown in the photos below. Though Reagan prevailed with the Saudi arms package, the political trade-off, viewed in retrospect, has severely damaged the leadership role of the USA as a solemnly-pledged sovereign equal among sovereign equals at the United Nations. With the rise of yet another silly Stanford Soviet expert, the official position of the USA that Zionist settlements in occupied Arab territories were "illegal" morphed into an ambiguous, more Zionist-friendly catchphrase "obstacles to peace." Dennis Ross continued under George H. W. Bush and then William Jefferson Clinton to undermine United Nations Security Council resolution 242 at the State Department. In so doing, Ross also undermined the Constitution of the United States, which holds that "all Treaties made, or which shall be made, under the Authority of the United States, shall be the supreme Law of the Land." For a citizen of the USA, disrespect for United Nations Security Council resolution 242 and the Charter of the United Nations is tantamount to disrespect for the Constitution of the USA! The recent treatment of the Zionist lobby by professors Stephen Walt and John Mearsheimer barely scratches the surface when you consider this statement by former chairman of the Joint Chiefs of Staff, the late Admiral Thomas H. Moorer, made on 24 August 1983: "I've never seen a president - I don't care who he is - stand up to them. It just boggles the mind. They always get what they want. The Israelis know what is going on all the time. I got to the point where I wasn't writing anything down. If the American people understood what a grip these people have got on our government, they would rise up in arms. Our citizens certainly don't have any idea what goes on." Perhaps the most intriguing of all the evidence pertaining to the demise of the EC-135N, as noted in the Chapman report, were the incomplete transponder beacon return signals recorded at the Leesburg, Virginia air traffic control center just seconds before the jet began its plunge. This, I pointed out in my fax broadcast, suggested electro-magnetic wave interference, or sabotage by remote control of the aircraft. I suggested that Egypt Air flight 990 may have met the same fate. 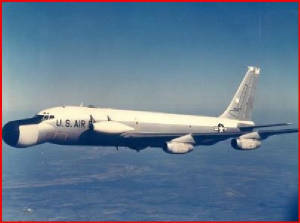 Unlike the Egypt Air 767, the EC-135N did not have a voice recorder on board. The last radio communication from the pilot was routine. But not until the official story of 9/11 began to unravel did I begin to fathom the significance of the cockpit voices from Egypt Air 990. They were fake! These voices were the result of the technological wonder called digital voice morphing in which the sound of anybody's voice can be duplicated in real time. If the full range of the subject's voice has been recorded, which usually can happen in a 10 minute phone conversation, and then fed into the computer software, anybody speaking the subject's language can very convincingly sound like the subject person on the phone to his or her family, friends, coworkers, etc. etc.. In practical terms, problems with voice morphing will arise when gaps in the impersonator's knowledge become apparent to his or her interlocutor. Americans need to suspend their games and other entertainments and engage themselves in a national day of reckoning about what really happened on 9/11. When Americans can see actors and actresses portraying the alleged hijackers and other passengers on United Airlines Flight 93, but cannot view them on any surveillance videotape from any of the "Category X" high security international airports from which the flights of 9/11 departed, one can only conclude that there is something radically wrong. There is a Praxis of Evil in our midst. A fungus among us. The Scholars for 9/11 Truth and the Scientific Panel Investigating 9/11, among others, have proved beyond any reasonable doubt that the 9/11 Commission Report is part of a cover-up of what really happened on 9/11. Indeed, all the lies that we have been told about weapons of mass destruction in Iraq - and they were very big lies - are but little ones when compared with the BIG LIE about 9/11. There is an urgent need to reopen the investigations of the EC-135N disaster, the Egypt Air Flight 990 disaster and the attacks of 9/11. These investigations must take into account the Talmudic law of the Moser, which, like the Mafioso code of Omertà, prohibits a Jew from informing upon another Jew to a non-Jew, a practice that is not only diametrically opposed to the adversarial process of our legal and judicial systems, but also to the proper functioning of our intelligence and law enforcement communities. Battle lines must be drawn. This Praxis of Evil, or fungus among us, cannot be allowed to co-opt our public officials any more. Already the party of Sodom and Gomorrah and Tel Aviv is hinting at a Hillary Clinton - John Murtha ticket for the up-coming presidential election in 2008. Murtha's congressional district in Pennsylvania is where United Airlines Flight 93 left an 8 mile wide debris field after being shot down with two Sidewinder missiles. It is apparent that Murtha is being rewarded for not challenging the absurd, official story of what happened to flight 93. Murtha's failure to be honest and open about the locally-reported 8 mile wide debris field extending west from New Baltimore in his own congressional district (before redistricting) makes him at the very least an accessory after the fact with respect to the attacks of 9/11. When you consider that he is in the opposition party trying to bring down the Party of God's Wrath We Deliver from Dimona, the future of the United States does not look very bright. I suppose that all of Asia can hardly wait to breath in the radioactive fallout from an attack on Iran. What goes around comes around. Isn't that so?